Matbucha is a beautiful Middle Eastern appetizer made with tomatoes and roasted bell peppers, seasoned with garlic and herbs. • Preheat oven to broil. • Prepare Peppers: turn your broiler to high and arrange your peppers on a foil lined baking pan. Place under broiler 4-6″ from flame, turning often with tongs until all sides are blackened. Peel, core, and de-seed the peppers. Then, cut into 1/2″ strips. • Prepare Tomatoes: scald tomatoes in boiling water for 1-2 minutes. Remove from water, place in ice bath. Peel, core, and de-seed the tomatoes. Then, cut into 1/2″ strips. • Heat olive oil in a large pan over medium heat. • Add garlic, cook but do not brown. • Add peppers, tomatoes and bay leaf. • Reduce heat to a simmer, stir occasionally. • After one hour, add salt,sugar, paprika, tomato paste, stir. • Simmer for an additional hour, uncovered, and allow the sauce to reduce until the tomatoes have disintegrated. The peppers should retain their shape. • Serve chilled or at room temperature with a dash of lemon juice or hot sauce. • Store leftovers in the refrigerator for up to one week. • Leftovers may be frozen for up to three months. 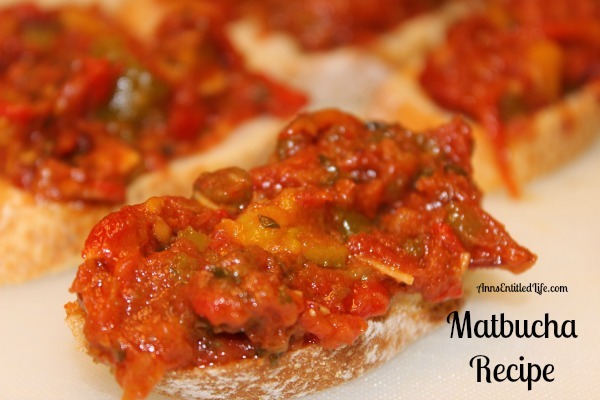 Hubby has been telling me about this recipe his mom used to make that used a lot of peppers. He’s put it on crackers or toast, and absolutely loved it as a kid. It is called Matbucha, and every middle eastern and north African family has a recipe of their own (my in-laws are all off the boat, er plane, from northern Africa). 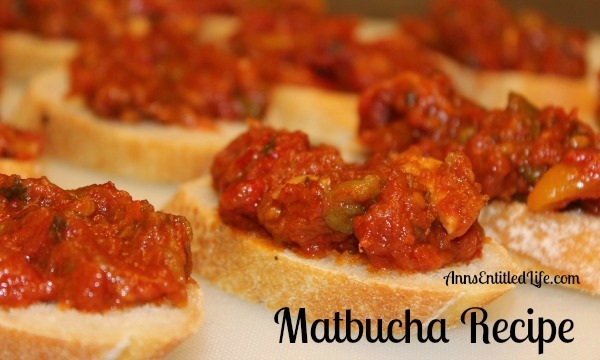 There are as many ways to make Matbucha as there are people in those regions. Hubby of course, ads his own flair to every recipe he makes. 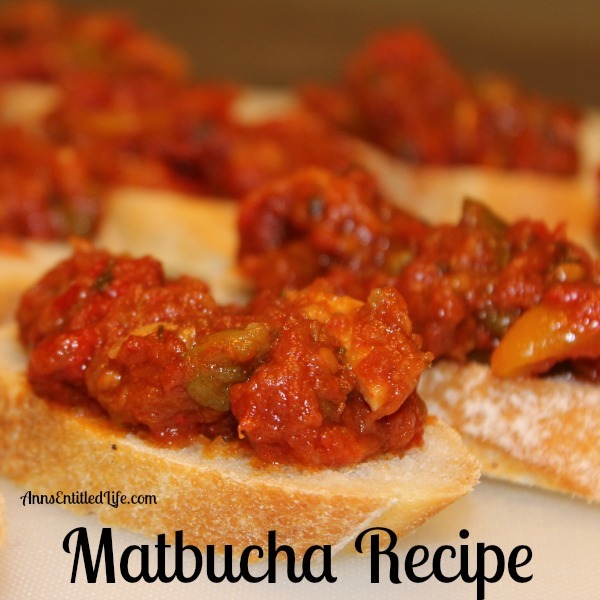 His Matbucha recipes is fantastic! When he described it to me I was not looking forward to trying it, but I ate far more it over the course of a week than he did. Totally delicious! 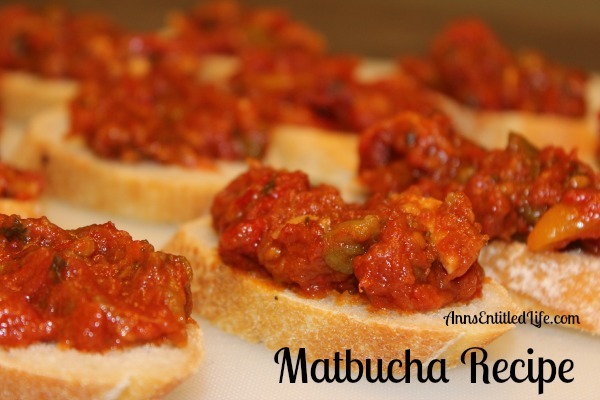 If you have a lot of green peppers and tomatoes, try the Matbucha. You will be glad you did. I am really excited to try Matbucha, Ann! We have a ton of peppers and tomatoes still, and I have been looking for something different to try with them. I hope you enjoy it, Jennifer. I was surprised at how much I liked it! This is great. My husband and I visited Istanbul in 2011. There was this “dip” that we ate with every single meal — it was that good. I’ve been looking for the recipe ever since. I’m crossing my fingers this is it. If not, then I’ll just have to go back to Turkey some day soon!